Camel Blue and Filter is out with a brandnew special edition. And also Memphis Classic is out with a brandnew special edition. Parisienne Jaune is out as a 25's pack. Lucky Strike is out new as "Flow Filter" in 20's and 25's edition. 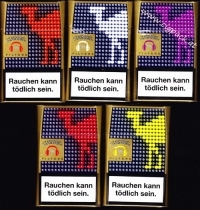 Gauloises frei von Zusätzen is out now in a new design. Lucky Strike Red and Lucky Strike Blue are out as 25's with new design now too. Winsto n Classic and Winston Blue are out as special edition as tin-lid. Marlboro Silver Blue are out now also as 25's packs. Memphis Blue and Memphis Air Blue are out with a new special edition. There is out Marlboro Advance Blue with Clearsense Filter with 0,6 mg tar and 0,5 mg nicotine - the bar-code is 9041 2646. The production of Hobby Softpack will be stopped soon and there is out a special version on foile for asking people to change to Hobby Hardpack. Mark 1 Gold and Mark 1 Red are out as 100's version.